The stage is now set for the first bilateral talks between Narendra Modi and Vladimir Putin on the sidelines of the BRICS summit in Brazil. 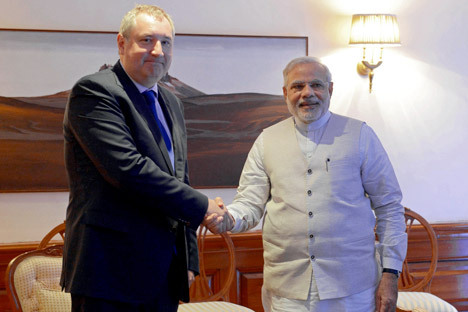 Rogozin confirmed that Russia will retain its strategic presence in India, primarily, by increasing cooperation in the fields of nuclear energy, space exploration and space technology. And also - joint development of the multi-purpose transport plane and the fifth generation fighter aircraft. The creation of samples and development of unique weapons and military equipment in joint ventures in India will be another priority in the cooperation between the two countries. In recent years, there were difficulties in the implementation of energy and defence contracts. In order to minimize these risks, during the talks it was agreed upon to establish a “working group on complex projects”. For each of the problematic issues, this group is supposed to swiftly charter out a roadmap and propose solutions to the intergovernmental commission on cooperation. Yet another working mechanism is planned to be set up to monitor the implementation of strategic projects. And their numbers will increase as a joint “road map” is scheduled to be created in the field of investment. Sources close to the negotiations said that the sides are in favour of swift development and signing of a new agreement on support and mutual protection of investments. It is especially important because Indian oil and gas companies intend to participate in the development projects of energy resources in Siberia, the Far East and the Arctic shelf of Russia. India’s oil and gas bellwether ONGC and Rosneft are considering working together for the development Yurubcheno-Tokhomsky gas condensate field in the Krasnoyarsk Region. Indian Oil Corporation is also contemplating on becoming a partner of Russian companies in projects for the production of liquefied natural gas (LNG). Experts believe that the joint development in LNG projects, along with the high demand for natural gas in India will translate relations in the gas sector into a primary and strategic segment in the Russian-Indian partnership.